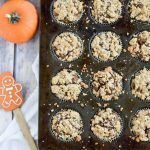 These Gingerbread Spice Muffins are full of flavor with a secret shortcut ingredient and a sweet crumb topping. Moist and delicious, they are sure to be a hit over the holidays. This post is sponsored by Celestial Seasonings but all opinions are 100% my own. Can you believe it’s gingerbread time? Already? How is this possible? Okay, I know you may say it’s turkey time but it’s never too early to start planning for Christmas. And since when did gingerbread become a “holidays only” treat? It’s delicious enough to eat all fall and winter long, so why wait? I have to admit, I haven’t always been a fan of gingerbread. My mom used to make it every Christmas and I always turned my nose up at it. But now that I’m all grown up (am I really?) I love it. I love the smell that permeates the house and it takes me back to being a kid. 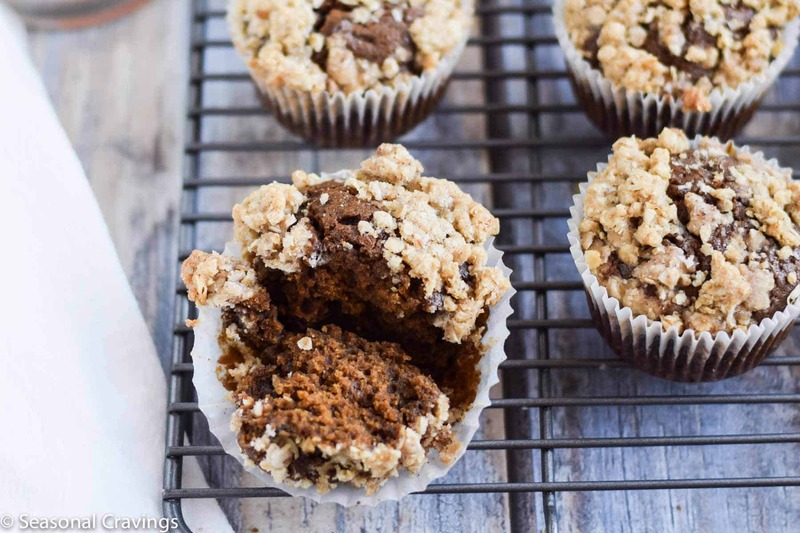 These Gingerbread Spice Muffins are full of holiday goodness. 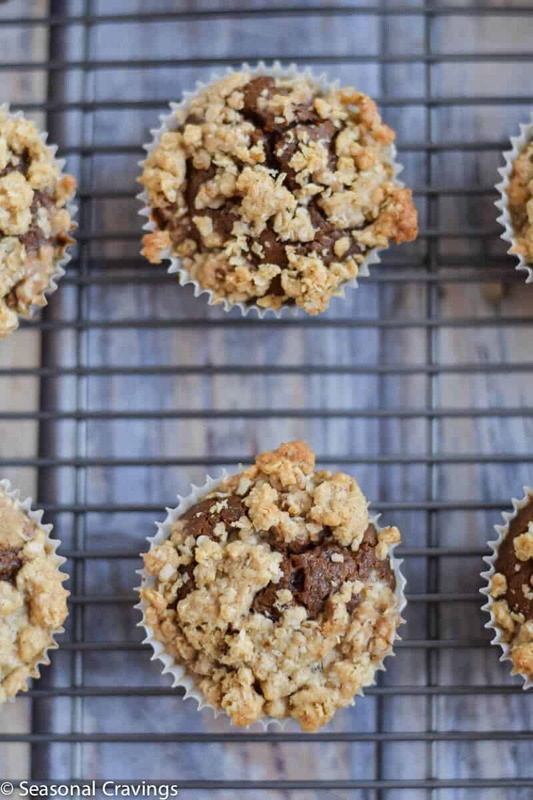 They are sweet and spicy with a rich crumb topping. The muffin itself isn’t super sweet so you can indulge in the buttery, sugar filled topping just this once. They are a hearty breakfast/sweet treat all rolled into one. I use a secret ingredient that adds so much spicy goodness and keeps them moist → Gingerbread Spice Tea from Celestial Seasonings. We all know their delicious teas, but did you know they can help you make delicious baked goods? This particular tea is full of cinnamon, chicory, and ginger and it really makes these Gingerbread Spice Muffins flavorful and moist. That’s the magic of tea! 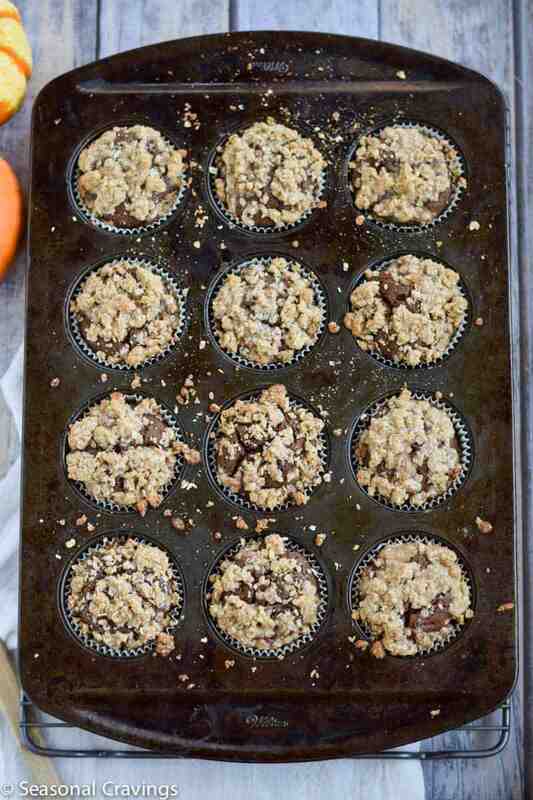 These muffins couldn’t be easier. You have to mix the wet and dry ingredients separately to prevent overmixing. Keeping a close eye on them in the oven will ensure that you don’t overcook them. See my notes for easy gluten free substitutions. Package these babies up in boxes with ribbons and give them to your kid’s teachers. They are sure to get straight A’s all year! Put 2/3 cup water in a mug. Microwave on high for 1 1/2 minutes. Add two Celestial Seasonings Gingerbread Spice tea bags and set aside. Whisk dry ingredients in a large bowl, flour - brown sugar. Take the tea bags and squeeze well into your mug. This gets all the flavor out of them. In another bowl whisk egg, vanilla, molasses, syrup and brewed tea. Stir dry ingredients into wet ingredients just until combined. Do not overmix. 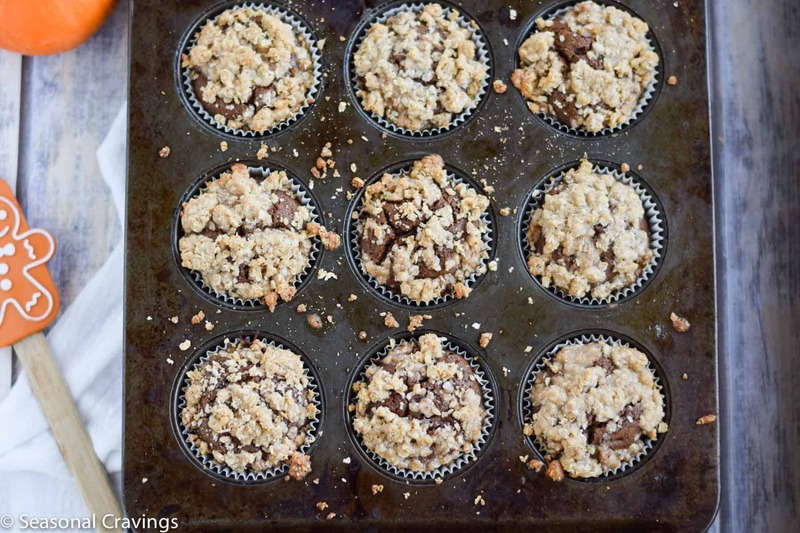 Pour batter into muffin cups until 3/4 full. I used an ice cream scoop. In a small bowl mix all the crumb topping ingredients. Use a pastry blender or your fingers to mix. It should resemble a coarse crumb. Bake for 17-19 minutes or until tops are fully set. Do not overbake. You can also check with a toothpick. Notes: To make these gluten free, substitute Bob’s Red Mill 1 to 1 Gluten Free flour in both spots where it says all purpose flour. Also, make sure you use gluten free oats for the crumb topping. This is a sponsored post on behalf of Celestial Seasonings Tea. All opinions are my own. OMG I LOVE CELESTIAL SEASONINGS TEAS! I haven’t tried the pumpkin spice or gingerbread ones yet but I practically live on the Bengal Spice. So delicious! 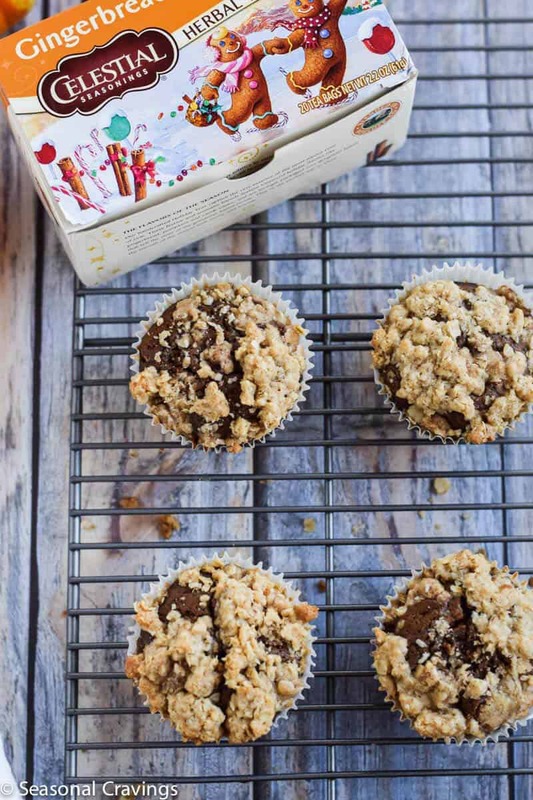 I have yet to try cooking with tea though believe it or not – your muffins look delicious and so comforting! Thanks Taylor! I love their teas too. These sound just perfect for the holidays! I’ve always been a huge fan of ginger flavored cookies – the soft chewy ones, not the hard crunchy ones – so I know I’d love these too! Thanks Mary Ann! You too! It’s amazing!!! Can’t wait to eat it. I’ll try to make it with your recipe tomorrow for my tea break in the evening. Thanks so much for your recipe!! !